Elizabeth wasn’t comforted by her aunt’s assertion. Madeline Gardiner’s skill as a doctor was unquestioned and she possessed a surprising array of knowledge about Bajan history, geography, and culture, but her crystal ball was flawed. Her prediction—that William would call on Saturday—had proved untrue, and as the hours passed on Sunday without any word from him, Elizabeth found herself increasingly unable to think of anything or anyone else. Despite her preoccupation her first two days on Barbados had offered plenty of enjoyment. The island’s combination of natural beauty and British colonial heritage was irresistible, and despite Elizabeth’s good-natured grumbling about the breakneck pace of their travels she had to admit that her aunt had ferreted out interesting places to visit. They had spent Saturday touring the beaches and plantation houses of the island’s southern parishes, returning to the hotel just in time to clean up for dinner. Elizabeth, pleading a headache, had sent the Gardiners off without her and had dined alone on her terrace overlooking the garden and the placid sea. A paradise like this was built for couples and the evenings were particularly romantic, but not with one’s niece tagging along. If her plan had also kept her within earshot of the telephone, it had been merely a lucky coincidence, or so she told herself. Unfortunately, an evening spent alone was an evening with little to distract her from thoughts of William. She had left her room briefly after dinner for a walk on the beach, hoping to escape the reflections of him that seemed to haunt every corner of the room, but her obsession had tagged along in her wake like a persistent shadow. Immediately on her arrival at the beach, she had noticed a tall figure standing alone at the water’s edge, staring out to sea. The darkness that obscured his face had silhouetted a broad-shouldered frame with wavy hair ruffled by the breeze. Her heart had at first leapt at the sight, but then he had begun to walk toward her without any hint of William’s loose-limbed, graceful stride. She had left the beach to return to her terrace, where at least her eyes and her heart wouldn’t play tricks on her. Her aunt and uncle had returned from dinner to find her still on the terrace, William’s music pouring into her ears through her headphones. Elizabeth knew she ought to stop listening to his music, but what had started as a casual pursuit on Wednesday had by Saturday evening become an obsession. She had even listened, for the first time since their argument, to the Rachmaninoff piano concerto. The Brahms Intermezzo, which she thought of as William’s gift to her, was absent from her music collection, and perhaps that was just as well. She had shed more than a few private tears during the Rachmaninoff, but the Brahms was even closer to her heart. On Sunday morning, after enjoying facials and massages at the hotel spa, Madeline and Elizabeth had set out on a tour of the northeast coast of the island. They were presently at St. Nicholas Abbey, a stately Jacobean-style plantation house built in the mid-1600s. 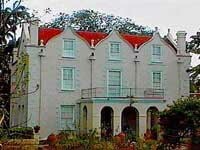 One of the oldest “great houses” on Barbados, it was also one of the best preserved. They had toured the house and grounds and were seated in the outdoor gazebo finishing their lunch. “I’m sure the hotel’s grateful that you can’t wear out voicemail through constant use,” Madeline teased. As Elizabeth accompanied her aunt to the parking lot, she resolved to stop looking for phones around every corner, to banish his music from her head, and above all to curtail her string of false William Darcy sightings. When they returned to the hotel she would call his cell phone again, and until then she would put him out of her mind. 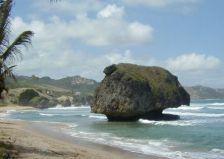 Two hours later the final movement of Rachmaninoff’s Second Piano Concerto reverberated in Elizabeth’s head as she wandered along Bathsheba Beach, inspecting one of the moss-covered boulders perched precariously in the sand as though dropped there by a negligent behemoth. She no longer needed headphones or speakers to hear William play; his music had become the soundtrack of her life. The sun was hotter here than in California, larger and somehow more aggressive, casting sharply defined shadows that grew longer as the afternoon progressed. Its rays warmed her arms and shoulders, but the damp ocean breeze swooped in defiantly to cool them. She had stashed her sandals in her tote bag, and the talcum-powder sand squished between her toes with each step. A sand crab, wary of her approach, skittered into a large hole and vanished from view. She turned her gaze on the surfers attempting to ride the powerful waves of the Soup Bowl. Madeline’s tour book claimed that the renowned surfing spot had gotten its nickname because the surfers, when tossed about in the churning water, resembled vegetables floating in a bowl of soup. They didn’t look much like carrots or peas to Elizabeth, but she had her imagination on a tight leash at the moment. Otherwise they’d probably all looked like William. Her attempts to banish him from her mind had proved futile as they neared Bathsheba. Pemberley, his beloved second home, was perched on a cliff somewhere close by. The sleepy village with its narrow lanes, its palm-fringed beach park, and its long stretch of sand strewn with boulders all matched his descriptions so precisely that it was impossible not to envision him here. Despite her best intentions she caught herself scanning the beach as though expecting him to pop out from behind the nearest rock formation. She didn’t know why he hadn’t called, but she didn’t plan to wait much longer. It had seemed safer to wait until they talked before flying to New York, if only to ensure that he was actually there, but she was running out of patience. Unless he called by the end of the day, she would simply plan a trip to New York and hope for the best. Her face flushed with sudden shame. Her patience was exhausted after three days of waiting; how much worse must the past two weeks have been for him? Madeline strolled along the high tide line a short distance away, beachcombing. The surf on this side of the island was too rough to yield intact shells of impressive size, but tiny ones could be found among the shards of their larger cousins flung onto the beach by the fierce waves. It was easy to see why most of the hotels were clustered along the west coast, with its pink and white beaches, gentle waters, and golden sunsets. But the sparsely populated, windswept east coast was exactly the sort of place that would suit William. And there I go, thinking about him again. Snickering at her lack of mental discipline, she glanced down the beach and saw a man jogging toward her. At this distance, the man reminded her of William. Her heart leapt, and she snickered again, shaking her head at her foolishness. In her current state, she could probably see almost any man approaching, even Bill Collins, and find a resemblance to William. She turned back to watch the surfers, but her heart had begun to rap out a frantic message. After a few seconds of resistance her eyes slid back to the jogger. Her breath caught in her chest and she froze, her eyes locked on what had to be a mirage. As the distance closed between them she saw his height, his dark hair, and his heartbreakingly familiar stride, full of power and grace that even the difficult footing of the powdery sand couldn’t diminish. It seemed impossible—it was impossible—and yet here he was. She could tell the instant he saw her, because he stumbled slightly and stopped running. He stood still and stared at her for what seemed like several minutes, but was probably only a few seconds. Then he strode toward her at a deliberate pace. She approached him on legs that felt like rubber, and in a remote part of her brain she wondered why her hands were shaking. They came to a stop facing each other. His mouth opened and then closed again. “Elizabeth,” he croaked, his chest rising and falling rapidly. “Hello, William.” A dizzy tangle of thoughts whirled through her brain, making it difficult to speak. He dragged a hand through his sweat-dampened hair. “I … ah … it’s good to see you.” He seemed unsure what to do with his hands. First he rubbed one over his unshaven jaw. It fell from there to his hip, evidently trying to shove itself into a nonexistent pocket. Finally, after a downward grimace, he crossed his arms awkwardly over his bare chest and stared at his shoes. She wanted to defuse their mutual discomfort, but her usual quick tongue seemed glued to the roof of her mouth. “I didn’t know you were coming down here,” she said at last with a weak smile. She removed her sunglasses, parking them on top of her head. Elizabeth wouldn’t have been surprised to see affection, fear, or even anger on his face. But aside from a small frown his expression was bland, his eyes dark and wary, and judging from his fidgety body language he couldn’t wait to escape. Perhaps he hadn’t wanted her to know he was on the island. Perhaps she’d waited too long to call and he’d stopped loving her. “I know,” he said softly, glancing down at his shoes again. Her heat sank. The Darcys must have relocated their Thanksgiving celebration to Barbados, with William flying directly from Sydney to meet them. That meant he had been here last night, perhaps gazing up at the same moonlit sky she had studied from her terrace while praying for the phone to ring. He’d gotten her messages, and had known she was on the island, just a few miles away, but he hadn’t called. And whose fault is that? You did the same thing to him. No wonder he doesn’t want to talk to you. With this painful reality gnawing at her, she couldn’t bear to look into his remote, hooded eyes any longer. Her gaze dropped below his neck, which served only to increase her discomfort. He was clad in nothing but running shoes and a pair of loose-fitting black swim trunks; his chest gleaming with sweat, and his skin was lighty tanned. Her hand threatened to rise up on its own initiative to explore the contours that had pillowed her head just a few weeks before. Swallowing, she forced her gaze up to his face, reeling under the impact of the effortless virility he radiated. As their eyes met again he donned a noncommittal expression, but not before she saw a flash of unmistakable longing in his eyes. He was swathed in his protective armor, but a vulnerable heart beat beneath it, a heart that still—she hoped—belonged to her. “Lizzy!” It was Madeline, hurrying in their direction as fast as the soft sand would allow. “I just saw that it’s half past three! And we promised Edward we’d be back by four.” When she reached Elizabeth’s side, she started slightly, perhaps recognizing William from publicity photos. Elizabeth made the introductions and watched while William accepted Madeline’s proffered handshake. “I appreciated your help,” he replied with a courtly nod. “He asked our help getting a recipe for your birthday dinner,” Madeline said. His eyes flared, and he took a small step toward her. The sudden intensity of his dark gaze made her shiver. She had drowned in those deep brown eyes before, and she found herself unable to look away. William pressed his lips together, his eyes narrowing, and Elizabeth saw a muscle working in his jaw. Her uncle had specifically asked her to attend the party. One of his friends, a Broadway buff who had once seen her in Rent, wanted to meet her. But William mattered more than a social event. She was on the verge of sending her aunt back to the hotel alone when Madeline offered a tidy solution. “If you’re sure Mr. Gardiner wouldn’t mind …” He glanced at Elizabeth, his eyebrows elevated in a silent question. “I’d like that,” he said, his dimples finally making a tentative appearance. She smiled, and their eyes locked for a long, breathless moment. Then he nodded and turned away. Elizabeth laughed, her eyes still fastened on William’s retreating form. At last he vanished behind a field of boulders, and she glanced around to find her aunt already halfway to their rental car. With the lightning-fast Black Key Etude playing in her mind, she sprinted across the sand to catch up. William’s body and mind had been locked in battle many times before, the mind advocating logic and discipline while the body sought sensory enjoyment. His mind usually emerged victorious from these skirmishes, but there were times when his body lacked the will or the means to follow where the mind led. This was one of those times. He was simply too exhausted to keep running. He had encountered Elizabeth near the midpoint of his planned run, leaving him almost three miles from Pemberley, the final half-mile a grueling uphill trek. Ordinarily he relished the challenge. It was a chance for his mind to hold sway over his body, to push his burning legs to the next level. But today he’d had to stop halfway up the steep path. He leaned forward, palms braced on his thighs as he dragged in huge, gasping lungfuls of humid tropical air. He felt a moment of panic, recalling the incident in Central Park last summer, but this was different. His heart was beating rapidly but it wasn’t pounding with terrifying intensity as it had then, and unlike that day he sensed no danger of losing consciousness. But should a soft, clean bed materialize along the side of the road he doubted his ability to bypass it. A bed. It was a dangerous thought. His five-hour nap in New York last evening had made only a small dent in the sleep debt his body clearly intended to see repaid in full. After his long and emotion-laden conversation with his grandmother, culminating in his decision to leave for Barbados in the morning, sleep had been out of the question. He had returned to his office to make his plane reservations, silently cursing Sonya for her absence in his time of need. Then he had retreated to his sitting room with a book, dozing briefly once or twice but otherwise awake, awaiting the coming of the new day—a day when he might regain Elizabeth, or lose her forever. Even with his admittedly pessimistic nature he couldn’t deny that she seemed ready to forgive him. Certainly her smiles had been encouraging. Caroline Bingley might choose to submerge anger beneath synthetic cheer to lull a rival into carelessness. Jane Bennet might do it for the sake of courtesy, if she felt the anger at all, with her benevolent nature. But Elizabeth didn’t dole out insincere warmth. Had her phone calls been a prelude to a break-up, she would have made that clear during their accidental meeting on the beach. A tiny gecko skittered across the path as William levered himself upright, and he watched it vanish into the tall grass. His head still swam with exhaustion, but his breathing was nearly back to normal. He’d done all the running his body could handle until he got a good night’s sleep, but he could still walk. He set off at a brisk pace, anxious to get back to Pemberley and prepare for the party. On the flight down to the island that morning he had repeatedly envisioned his first meeting with Elizabeth. She would open the door to her hotel room and find him standing there, clean shaven and dressed in his favorite sport coat, a sheaf of roses in his hands. He would be confident and glib, saying all the right things and melting her heart. He snorted and glanced down at himself. Instead, Elizabeth—and her aunt, which had made the situation even worse—had encountered him barely dressed, unshaven, and dripping with sweat, his damp hair a wild mass of curls, his tongue tied in intricate knots. Why the most mortifying moments of his life had nearly all occurred in Elizabeth’s presence was a question that deserved consideration … some other time. But he would have a second chance, and soon. Had it not been so, he wouldn’t have allowed her to leave despite her aunt’s insistence and his humiliating condition. There was too much at stake to risk letting her slip away. But Mrs. Gardiner’s invitation had neatly resolved the problem, and now it was left to him to make the most of it. He reached the crest of the hill and turned down the lane toward Pemberley with a sigh of relief. His body, anticipating the delights of a cool, cleansing shower, found a tiny reserve of energy and he broke into a trot, passing through the curved arch of the whitewashed gatehouse. His mind, satisfied with his body’s cooperation, leapt ahead to impending challenges, sifting through his wardrobe options and making plans for the most important evening of his life. William had begun to wonder if time moved more slowly closer to the equator. It felt that way as he sat in his car on the hotel’s curved driveway, waiting until he could proceed to the Gardiners’ suite. To many people an invitation for five o’clock implied a “fashionably late” arrival at a quarter past, but William believed in punctuality. Besides, by arriving first he hoped to claim Elizabeth’s undivided attention, perhaps drawing her off to a quiet nook where they could talk privately. This enticing vision had hurried him through his shower despite the temptation to linger under the refreshing spray. He had risked shredding his face into a bloody pulp while shaving at a furious speed, but he had managed to escape with only one small nick on the underside of his jaw. He had grumbled an oath or two at the discovery that his shoes didn’t match, but since he had made the discovery while walking to his car it had taken only a minute or two to return to the house to synchronize his footgear. And after all that haste, he found himself sitting in his car drumming his fingers on the dashboard—playing, as he belatedly realized, the first movement of Gershwin’s Piano Concerto in F.
Finally he could sit still no longer. He pulled up to the valet parking stand and reluctantly surrendered his Porsche convertible to the tender mercies of the waiting attendant. William hoped the lavish tip he offered would buy careful handling for the car. When he arrived at Suite 304 he was surprised to hear the buzz of voices inside, punctuated by a burst of raucous laughter. He checked his watch to verify that it was exactly five and then knocked at the door, his visions of a quiet chat with Elizabeth shattered by the din inside. His annoyance melted when she opened the door and he saw the luminous smile that spread across her face. “Hi,” she said softly, her eyes glowing like the emeralds to which he often compared them … making them a perfect match to the pendant that glittered around her neck. He nearly pulled her into his arms on the spot. She must have known it was the single gesture best engineered to communicate her feelings. “My God, you’re beautiful,” he breathed, his carefully-planned speech driven from his mind by the sight of her. Not for the first time he marveled at the strange alchemy she possessed, making her more bewitching each time he saw her. Her dress fastened at one shoulder, falling in silky layers that stopped at her knees. Her hair floated around her face in a lush cloud, and he barely stopped himself from reaching out to feel its texture against his fingers. “Thank you,” she said softly, a hint of amusement in her smile, and it took him a moment to remember what he’d said in lieu of a proper greeting. “You look nice yourself.” The appreciation in her eyes proved that she wasn’t just being polite. He had known he’d be overdressed in his black polo shirt and gray suit—most of the men in the room wore tropical print shirts and Bermuda shorts—but he’d wanted to look his best after his disreputable appearance on the beach. “I thought the party started at five,” he said, peering into the crowded room. “I assume this is an orthopedists’ conference?” Elizabeth had often spoken of the Gardiners’ careers with warm pride. He was glad he had paid attention. William nodded. An hour of this noise to endure, unless he could tempt Elizabeth to escape sooner. “Let’s get you a drink,” she said, leading him on a serpentine path through the crowded room. It occurred to him that in similar circumstances in the past she had often taken his hand. They hadn’t touched today, not even fleeting contact; in fact, he found himself avoiding doing so and suspected the same was true for her. It was as though each of them existed inside a fragile bubble, one that could easily burst with fearsome consequences if they drifted too close together. As long as things stayed light and inconsequential, as long as no emotional chord vibrated between them, they would be safe from harm. Safe, but stuck in a place where no progress could be made. Armed with a glass of red wine, he followed Elizabeth onto the terrace. The air was thick with smoke, and he saw several men and at least one woman brandishing cigars. “Lizzy, come over here!” A man with salt-and-pepper hair and a neatly trimmed moustache below a long, thin nose waved his cigar in a jaunty salute. He had a wiry, athletic build and an energetic manner, the air around him seeming to buzz with vitality even through the cloud of smoke that enveloped him. The man, whom William decided must be Elizabeth’s uncle, wrapped an arm around her shoulders as she reached his side. “I assume this is your young man?” he asked, his eyes friendly but appraising as they rested on William. “Call me Edward. Would you like a Cuban?” He gestured toward a half-empty cigar box on the table behind him. “Oh, please, not that worn-out legend again,” Elizabeth grumbled, but her lips twitched into a tiny smile. “Edward, there you are. I’ve been looking everywhere for you.” It was Madeline, grimacing and fanning her face to ward off the smoke. “We’re glad you’re here. I hate to keep showing up and dragging people away, but would you and Lizzy excuse us for a minute? We have a small catering problem and I need to consult with El Presidente.” Madeline directing a threatening look at Edward. “And don’t even think about bringing that vile thing inside.” She turned and hurried through the doors into the living room. Elizabeth watched him go and then gave William a nervous smile. “Alone at last, sort of.” Her eyes traveled in the direction of the knot of cigar smokers occupying most of the terrace. William’s reply was drowned out by a shout of laughter. He cast a resentful glance over his shoulder, his patience in short supply. He was tired of the noise of the other guests, and of being jostled by the self-appointed life of the party standing behind him. “Would you like to go somewhere quiet, or at least, quieter, and talk?” Elizabeth asked. “Yes.” There it was: the understatement of the year. She led the way, and a few minutes later they stood side by side on the private terrace off her room, leaning against the railing as they watched the sun sink into the ocean. The sky was ablaze in red, orange, and yellow with hints of blue and purple, the palm trees dark silhouettes against the riot of color. “Isn’t it beautiful?” she said in a hushed voice. “Mmm.” One disadvantage to Pemberley’s location on the east coast of the island was that the sun rose, instead of setting, over the water, and William was rarely awake in time to witness a sunrise. “Yesterday there were clouds right on the horizon so the view wasn’t as good. But this is perfect.” She smiled up at him, and he nearly leaned over to kiss her before stopping himself—and then wondered why he’d stopped. Yes, their protective bubbles were still intact and becoming more impervious by the minute. “I’d love to. In fact, if you hadn’t asked me, I was going to ask you.” She took a small sideways step in his direction, their arms almost, but not quite, touching where they rested on the railing. “And they didn’t take you with them?” He hoped she hadn’t had plans of her own, perhaps with a young surgeon who had found the Gardiners’ lovely niece an irresistible temptation. His smile turned into a mighty yawn, for which he quickly apologized. They fell silent again, both gazing out at the western sky. The sun continued to slip beneath the ocean, seeming to accelerate its pace until the final bright sliver dropped below the horizon. The last rays of light faded away, the colors in the sky blending into ever darker hues. “Yes, it was.” William rolled his eyes. Another scintillating remark. At this rate, I’ll bore her right to sleep. “Thank you for being so nice to my uncle,” she said quietly, staring at her wine glass. Say something! But he wasn’t sure what to say, so he filled the silence by finishing his wine. He glanced at her just as her eyes turned toward him, and they acknowledged the contact with awkward smiles. “Of course.” He stifled a yawn. With any luck the conversation wouldn’t take long and they could leave for dinner soon. So we can go on not talking about anything important. William dropped into his chair, scowling. She’d agreed to her uncle’s request with unflattering alacrity and had multiplied the insult by insisting on going alone. Still, it wasn’t as though the interruption made much difference. Rarely had he and Elizabeth been in the same room and said so little of significance. It reminded him of their first date in New York, when his nerves had nearly derailed their relationship before it had truly begun. William propped his feet on the chair opposite him and leaned back. He would close his eyes for a few minutes, just until she returned. Fifteen minutes passed before Elizabeth managed to extricate herself from the clutches of her uncle’s friend. “Long-winded” had been a polite way to describe him. She had done her best to paste an interested expression on her face while the man rambled on about a friend of a friend who once met Barbra Streisand’s accountant. At last she slipped away, hurrying through the door to her room and onto the terrace. She deposited her cargo, including her own glass of wine, on the table and used the matches she had brought to light the candle. In its meager light she saw that his eyes were closed. The poor man, flying halfway around the world and then leaving home the next morning to come here. It was no wonder he was exhausted. She seated herself as quietly as she could, flinching at the dull clang of metal on metal when her chair bumped the table leg. In their brief time as lovers she had cherished opportunities to watch him sleep. The lines of tension so often evident around his eyes were absent, subtracting years from his face and adding a touching vulnerability. A protective impulse welled up inside her, clogging her throat with emotion. He had subjected himself to a grueling travel schedule, and although she wasn’t certain, she guessed that he’d done it for her. When she and Madeline had returned to the hotel late that afternoon, a message from William had awaited—he had called not long after her last voicemail inquiry, and before setting out on his run along the beach. His words, though restrained, had corroborated the warm light she had seen in his eyes. So why are we sitting here spinning our wheels, chatting about sunsets and weather and scuba diving? She wondered if her expectations for their reunion had been influenced by unrealistic romances in films. Real-life love was a challenge … but things worth having were worth the effort. She settled back in her chair, gazing out over the garden. Lights were coming on all around the resort, the sky now fully dark. Once again she noticed the silky caress of the tropical night air against her skin. But tonight the warm scents of the garden competed with cigar smoke drifting from next door on the faint breeze. Someone on the living room terrace was shouting to an acquaintance passing by down below. Elizabeth sighed and shot a concerned glance at William, but it was too late. His eyes flew open and he sat forward abruptly. He blinked several times, licking his lips, and then noticed Elizabeth watching him. He nodded and glanced away, retrieving his wine glass from the table. William’s eyes were on the candle, the red glass jar surrounding it glowing weakly. “Yes, there is,” he said at last, his voice so soft she could barely hear him. “I do,” he said, speaking the words as a solemn vow. “That’s why I’m here.” He sat forward and grasped her hand, sending a filament of warmth shimmering up her arm. He loosened his grip on her hand and began to stroke her palm with his thumb, the heat of his touch melting her insides like the candle on the table. “I’m pleased to hear that,” he said. He nodded slowly and leaned forward, raising her hand to his lips. His eyes burned into hers as he turned her hand palm up, pressing a lingering kiss to her wrist. Elizabeth swallowed, trying to keep her thoughts from swimming out of focus. “And in that case …” Her voice was breathy beyond recognition. She drew her forearm from his grasp, took his face in her hands, and pressed her mouth to his. He grunted softly in obvious surprise, but his lips moved hungrily against hers and his hands cupped her bare shoulders. Stars exploded behind her eyes as they tasted, nibbled, and explored, the sensations thrilling her despite, or perhaps because of, their familiarity. When at last they drew apart, his eyes were half-lidded again, but with desire, not fatigue. “Now that’s what I like to see,” he murmured, tangling his fingers in the curls lying along her neck. “What?” She turned her head sideways to rest her cheek against his hand. She gladly settled onto his lap, sighing in contentment when his arms closed around her, strong and warm and wonderfully familiar. His eyes flared with hunger as they locked on her lips, but she stopped his head in mid-descent. “Let me look at you for a minute,” she whispered. Gradually the comfort of his presence seeped into her bones, and she began to dust soft kisses on his throat and jaw. With a low groan he turned his head and claimed her mouth in an incendiary kiss that demanded her soul. The flame already burning inside her roared into a bonfire and she clung to him, matching his passion and answering him with demands of her own. “Not by half,” he growled, and she shivered as his mouth covered hers again. Madeline Gardiner surveyed the living room. It was, to put it bluntly, a mess, with empty plates and glasses strewn everywhere. But unlike the aftermath of a party held in her home, here she needed only to leave a generous tip for the housekeeping staff who would tidy up in her absence. “Ready to go?” she called to Edward. They were running late; their guests had already moved on to the banquet room. He emerged from the bedroom, tucking his wallet into his trouser pocket. “Where are Lizzy and William?” he asked, glancing around. “I want the name of that dive operator he mentioned. I suppose they’re still on her terrace?” He turned toward the door to Elizabeth’s room, which was slightly ajar. “Don’t.” Madeline stepped into his path. Madeline retrieved her purse from the coffee table but didn’t follow him out the door, instead making a quick detour. As she gently shut the door leading to Elizabeth’s room, she heard soft laughter coming from the terrace. “Good for you, Lizzy,” she murmured, a warm smile stealing across her face as she hurried after her husband.